Vito Cavallo bakes taralli, crunchy bracelet-shaped Italian biscuits, from his mother's recipe. 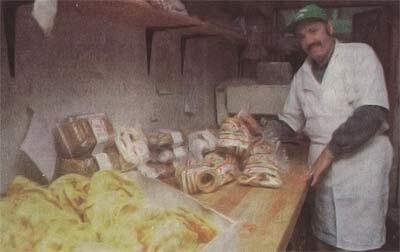 WATERBURY - When Vito Cavallo was growing up in Italy his favorite snack was the taralli his mother made in the brick out door oven. Little did he know he'd one day make his living bak ing these crunchy bracelet-shaped biscuits in America. "We say he was born with taral lion his hands," said his brother Robert, who helps him out at the America Street wholesale baking company. "It's my mother's recipe," ex plained Vito, who said he first came up with the idea of making a business out of baking when he was only 14 years and newly transplanted in America. "No one was making the taralli here," he said. "It was always in my mind that sometime I would make taralli." He eventually fulfilled his child hood dream by opening a small bakery in the deli he previously owned - Cavallo's of Town Plot. The word got out about the baked goods that he sold from his deli, and he soon found himself con tacted by other small stores and supermarkets. Eventually, he found himself at a crossroads - he needed to choose between the deli and the bakery. His childhood dream won out and he sold the deli and opened Gina Marie Bakery in 1982 in the space next door, naming the business after his daughters Gina and Rose Maria and his mother Maria. A drawing of his daughter Gina, now 15, serves as the compa ny's logo. Gina started "working" at the bakery when she was about six, helping to roll the taralli and still helps out frequently. His mother, who's since passed away, was thrilled to see her son making her taralil, Cavallo said. His wife Concetta is the mix-master today, whipping batches of batter for the company's many products like "angel wings," their best selling air- filled cookie, which is liberally coat ed with powdered sugar. "Every morning I tell the kitchen how much to make of what," Cavallo said. "I might say make two batches of angel wings and five batches of taralil. My wife always throws in one extra batch." Morning time is tasting time for the products. "I have a few taralli, a few angel wings to see how they taste," said Cavallo. If it's not up to snuff, he throws them out. "I have a hard time to make the angel wings just right. Sometimes there might be too much flavor. Sometimes, there's too much flavor. Sometimes the eggs are too cold. They have to be just at room tem perature or they don't come nice. You can't make angel wings on a rainy day. They come all mushy. When it's a nice, sunny day, they come beautiful." "The taralli are also very hard to make. You have to roll two or three times, get them smoother, mold them together, boll them, and after they boil, you put them on a tray and bake them so they get very hard, in the over. They get crispy and crunchy." Cavallo's small America Street bakery is stockpiled with fresh baked goods, packaged in transpar ent bags or clear plastic containers. The angel wings and the taralli (with either pepper or fennel) are their biggest sellers, but they offer a num ber of other products such as almond and fruit biscuits, anginette cookies, anisette sponge, friselle an pizzelle. They stick to fresh, pure ingredi ents. The pepper taralli, for example contains only flour, yeast, water, salt anise seed, black pepper and corn oil. While he started off with his mother's recipes, the others were concocted mainly by his wife Concetta. While they don't sell any of them directly to the public, their products can be found as close as the deli next door - L'Avventurra - or as far away as Norwalk. "I cover three-quarters, of the state." Cavallo insists on making the deliveries and stocking the shelves himself. "I want to make sure it's done right, that it looks good on the shelves. We hired someone before to make the deliveries, but it didn't work out." Surprisingly, he said, it not just people of Italian descent who gobbi up his product. They sell well at Stop & Shop, for instance, and in areas where there are few Italians.